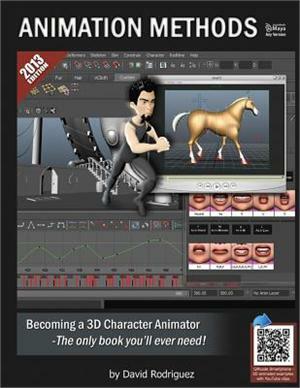 Whether you want to become a professional or just make your own animated movies and games, this book will show you all of the secrets used in a studio environment for specifically doing 3D Character Animation. The book Animation Methods is a step-by-step guide for learning Maya, animation tools, how to get into the industry, demo reel, interview process, body animation, and facial animation. You can quickly learn animation without ever setting a foot inside a classroom or paying a large tuition. Animation Methods is the only book that comes alive as you read it through QR codes. Use your smartphone to scan the codes and view a 3D animated clip of the lesson on YouTube. Not only will you read the lesson, but you will be able to see and understand it right on your phone. After all, animation is a visual art. Animation Methods will show you the techniques and workflows to use in any version of Maya. Once you grasp the easy methods, you'll be able to apply the same knowledge and animate any character in any software. David Rodriguez is an animation artist who has been working professionally since 2009. Credited on Piranha film, World War Z, Star Wars Kinect, and his recent work on Ice Age Continental Drift Arctic Games. He attended The Art Institute of Los Angeles, California where he learned the basics of animation and later perfected the art.